Roma Street Station in Brisbane has always been a bit of an enigma to me. For a key railway station that is supposed to be a culturally significant landmark location for catching a train in Queensland, it just comes across as a bit 'blah'. Not only is the modern day version overshadowed by the foreboding Brisbane Transit Centre, but in the wake of Brisbane hosting the political G20 Summit in 2014, security around the station has evolved into something of a regimented Communist exercise that borders on perestroika. Roma Street Station as I photographed it in 2004 when construction of the parklands had just begun. But it wasn't always that way. So first, let me paint you a picture of what Roma Street Station was once like. Long after the rail freight yards were relocated to Acacia Ridge inter-modal terminal in the south west of the city, plans were drawn up for what is today the Roma Street Parklands. As you can see in the above photograph taken back in 2004, work was progressing on the new Platform 10 structure which is today flanked by a wall of residential buildings to the right of picture. 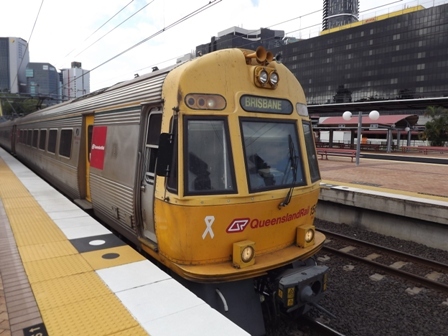 Today, platform 10 is the arrival and departure point for Queensland Rail's long distance passenger trains, the Spirit of the Outback to Longreach, the Spirit of Queensland Tilt Train to Cairns, and both the Rockhampton and Bundaberg Tilt Trains. However, if the Roma Street Parkland project was supposed to give the railway station a much needed face lift, it didn't. Dividing the railway station from the parkland with a wall of apartment buildings has only confined the station to a string of covered platforms located somewhere 'out the back' of everything. There is no integration between the two and the parkland is almost impossible to find when stepping from the train. 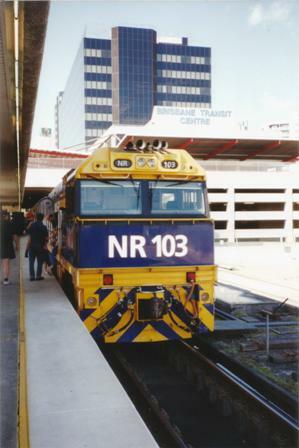 The Indian Pacific on a promotional trip to Brisbane in 2004. Worse still is what has become of Roma Street's platform one. 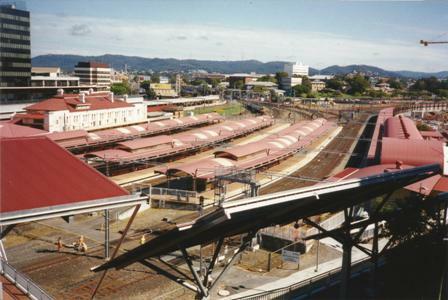 When the standard gauge line from Sydney was first extended across the Merivale Bridge in 1986, the Brisbane Transit Centre opened soon after on the southern side of the station. 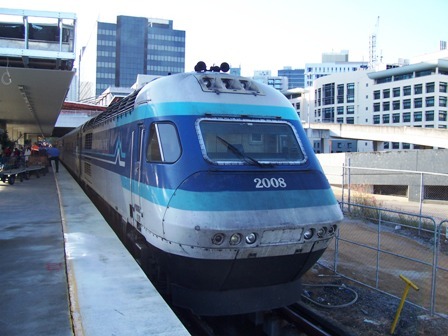 The Sydney XPT ready for its morning departure from Roma Street's platform 1 in 2007. What was supposed to be a fully integrated bus and train terminal soon resembled an archaic concrete parking lot with the iconic platform 1 buried beneath an unimaginative tomb of concrete support posts for the bus station above. The photo at the top of this post shows me standing beside the 'tail end' of the Sydney XPT beneath the bus terminal, while above you can see the front of the train standing alongside platform 1. 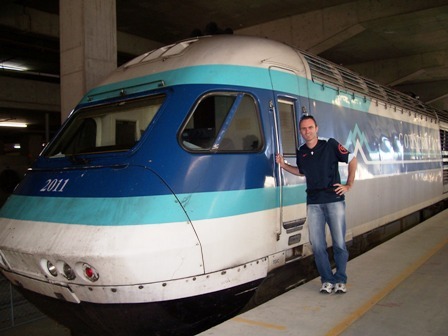 I arrived at Roma Street Station from the Sunshine Coast in 2016 on the former ICE train that once ran between Brisbane and Rockhampton. 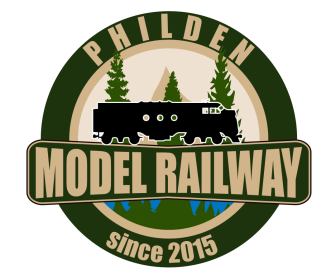 It has now been relegated to running the Gympie North service. Visit Roma Street Station today, and you will discover there is no platform 1. In its place is the Northern Busway, built to link the Brisbane City bus station beneath the Queens Street Mall with the Northern Suburbs via a dedicated bus-only roadway. The XPT now uses the dual gauge line that serves platform 2. Upstairs in the Brisbane Transit Centre, very little has changed since its opening in 1986. World Expo 88 may have come and gone, but the transit centre still has the same disjointed connection between trains on the ground level, buses on the upper level and a few fast food outlets caught somewhere in-between. I've caught both trains and buses from the Brisbane Transit Centre in the past, and compared to most domestic airports in the country, the transit centre is sadly outdated and a little dingy on the inside. Most commuters to Roma Street however, simply use the underground concourse to access the platforms, but fortunately on platform 4 you can still see a slice of what Roma Street Station was once like. 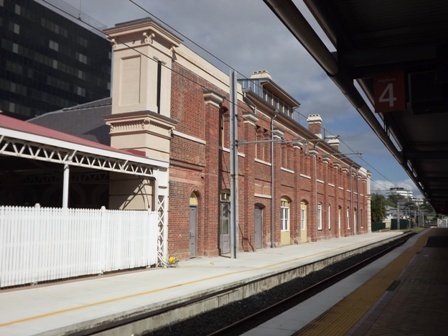 Roma Street Station's original 1874 brick building on platform 3 as photographed in 2016. The original station building is Brisbane's oldest, and dates back to 1874. The building faces platform 3 and when I last visited in 2016 was closed to the public for renovation. But for a station that is now overshadowed by progress on either side, it is nice to know that there is still a bit of history to be found that has not been swept aside. Without the historic station building on platform 3, Roma Street might well be no different to the archaic transit centre that stands above it, a replica of a Cold War utilitarian building that is designed more to withstand the elements, than to welcome its travelers. 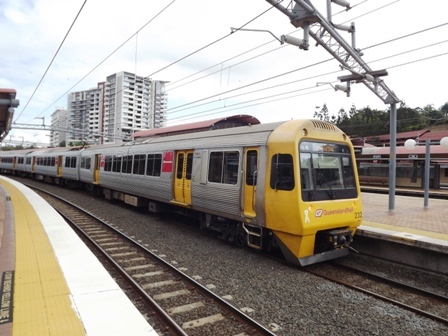 A Queensland Rail SMU220 set photographed at Roma Street in 2016. And perhaps that's where my stoic 1980's description of Roma Street Station meets the meaning of the word perestroika. Taking out my camera to photograph some trains at Roma Street Station in 2016 is a completely different to my past experiences, and I'm suddenly interrupted by a female Transit Officer who asks me to put my camera away. Apparently I was being monitored from upstairs and she was there to inform me as to why security cannot allow someone to photograph the surrounding infrastructure. In the next 60 seconds I'm also given an explanation as to why there are no rubbish bins on any of the platforms or within the station concourse. They are all new rules introduced at the time of the G20 Summit two years earlier, supposedly to keep the traveling public safe. Her open policy explanation all sounds very Mikhail Gorbachev to me, and for a second I'm wondering if perhaps Vladimir Putin had caught a train to Roma Street while the G20 was being held in Brisbane. Of course he didn't. The visiting world leaders were too busy being privately chauffeured around the city, or catching helicopters to and from the airport to be bothered boarding a train. It's all just a reminder of the world we live in. That's me at Roma Street beside the Carnival of Flowers express to Toowoomba in September 2014. 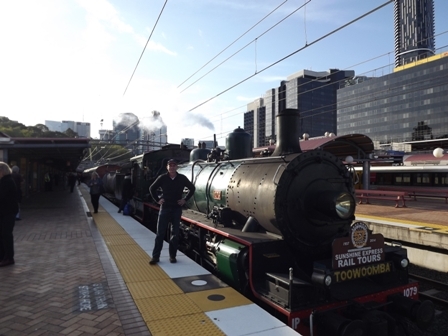 It seems the only time taking photographs of trains at Roma Street Station is viewed as acceptable, is when there is a steam train tour, such as the one above. In a flashback to happier days, (ironically in September 2014, 2 months prior to all the perestroika associated with the G20 Summit was introduced), I was able to freely shoot some early morning photos at Roma Street Station before boarding the Carnival of Flowers Express to Toowoomba. So when compiling the images I used in my book 30 Years Chasing Trains, I wisely steered clear of using any photo that dared show a piece of the station's infrastructure. 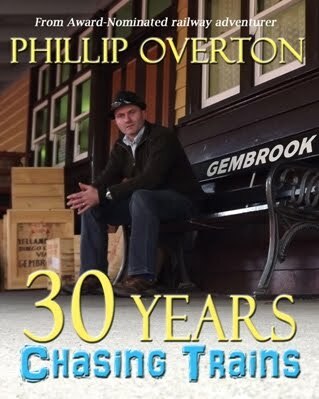 For an author, train enthusiast and railway photographer for the past 30 years, it has all got a little too complicated for my liking. These days when passing through Roma Street Station on the way to a Broncos game at nearby Suncorp Stadium, I don't so much as take my iPhone out of my pocket. Perhaps in years from now there will be no photos of what Roma Street Station looked like in the year 2020. Maybe that's just a bit of my own paranoia, but it certainly is a part of the enigma that is Roma Street Station. It's like a little bit of Russia Down Under, only don't send a postcard. Reading this makes me feel both nostalgic and sad. Working in the city late 70's early 80's I travelled both to and through Roma Street Station. It is sad when we lose historical sites and photographic records of how things used to be. Thanks for evoking memories of those days.